Board members come to nonprofit organizations with varying skills, understanding, and expectations. Though many are accomplished professionals with expertise in finance, law, marketing, or another area of great value to the organization, they don’t necessarily know what it means to be an effective board member. This is reflected in the behavior of some nonprofit board members. For example, they might not regularly attend or participate in board meetings, or may fail to follow through on commitments. In other instances, they might be domineering in board meetings, micromanage staff, or speak in confrontational or negative ways. Yet no one should bash the board or gnash their teeth when a nonprofit organization encounters this behavior. Instead, when people overstep or underperform, there’s an opportunity to help them become better board members. An organization can clarify roles and boundaries, address the issues, and ensure that future board members understand their responsibilities from the start. Imagine some worst-case scenarios. Though they may seem extreme, they’re all taken from the actual experiences of nonprofit organizations I’ve worked with as a board member or consultant. In one instance, a board was grappling with a contentious issue and brought the decision to a vote. The measure passed, but barely. Then one board member, still unhappy with the outcome, voiced dissatisfaction publicly. Unfortunately, the board member happened to share his negative feelings with the nonprofit’s single largest donor, which is never appropriate. What happens in a board meeting should stay in a board meeting. Members also need to recognize that when they join a board, they represent the entire organization, not just themselves. This means they must support decisions made by the board as a whole, no matter how much they may disagree. Nonprofit organizations can help their board members understand what is and what is not appropriate by creating and sharing a written code of conduct. This document informs board members that donor and client information is always confidential. It also makes clear that gossiping in the community is never acceptable. In another case, a board member met someone from a nonprofit with a similar mission. They talked about potential collaboration between their two organizations and agreed a partnership would go forward. But the board member was in no position to make this promise: The decision belonged to the nonprofit’s executive director with board input or approval if the collaboration impacted policy. Only if the executive director asked for board input or the decision had an impact on organizational policy would it be appropriate for anyone else to be involved. As this example illustrates, board members may not understand their role or realize the delineations and boundaries between the board and the executive director. Clarifying matters helps them know that their role is to govern, while the executive director manages day-to-day activities and directs staff. A strong board chair who has a good working relationship with the executive director can help ensure that board members understand their role. Developing a written job description for board members is also an effective way to make expectations clear and provide a reminder if a problem arises. In reality, board members usually have the nonprofit’s best interests in mind and often realize they’re acting in ways that challenge the organization. Once they’re made aware of the behavior and its effect on the rest of the board and the nonprofit as a whole, it typically doesn’t happen again. Sometimes, however, it takes more than a conversation—or even written policies and job descriptions—to change troublesome behavior. Fortunately, when it persists, nonprofit organizations have additional ways to deal with board members. One option is retraining, either individually or as a group. When I’ve worked with nonprofit organizations, we’ve held board retreats to review the role of members. This is the time to remind people what is expected of them and go over the code of conduct and appropriate policies for boards. Coaching is another useful approach. I like to involve the board chair because this presents an opportunity for peer-to-peer coaching. The executive director can also participate. Talk about the situation that’s troubling the organization. If the issue is a domineering board member, discuss other ways the person can express opinions. Coaching is closely related to counseling. Ask the board member whether the role is still a good match. 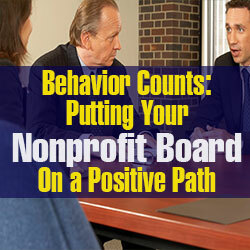 Also find out whether circumstances beyond the board are affecting the person’s behavior. Someone in a stressful situation may want to take a temporary leave, and suggesting this option shows support for a board colleague. Sometimes a person is simply in the wrong role. Instead of being a board member, someone might prefer to help with a specific activity or program. Reassigning a board member to a different, more enjoyable role resolves problem behavior and keeps the person close to the organization. If all else fails, nonprofits should be able to fire a board member. When behavior can no longer be tolerated and retraining, coaching, and counseling haven’t worked, it’s time to vote for removal. Though this rarely happens, when it does, it is important to be respectful. Also be certain to have strong documentation of the behavior that led to dismissal, which should reflect the organization’s board personnel policy. Thank the person for serving on the board and end the relationship. Although dealing with a difficult member can be challenging, the experience often creates a greater sense of community on the board. Afterward, I’ve seen board members grow closer and become friends. The result is not only an effective board that works well together but also a stronger organization. A targeted and thoughtful approach to board recruitment can help organizations avoid many of the kinds of issues I’ve described. There’s far more to consider than a person’s willingness to serve. Nonprofits should start by taking a snapshot of their current board, evaluating the strengths and interests of its members. Comparing these with the organization’s strategic plan will point out gaps to fill through recruitment. For example, if fundraising is a priority but only one person has an interest and experience in this area, look for this expertise in a new board member. Also consider board representation and whether there’s an opportunity to diversify based on geography, gender, or another characteristic appropriate for the organization and its mission. Aim to identify more candidates than there are openings on the board. Vet these prospective board members internally and have someone on the nominating committee speak to them directly. This way, there are enough candidates to choose from if some are too busy to become board members, but it isn’t necessary to accept everyone. Send candidates a job description, and outline the function of the board. Remember, if people are simply asked to join a board, they won’t know what to expect. Next, I recommend that the executive director and board members interview interested candidates. This will provide a sense of the person’s motivation to become a board member. For example, is the candidate focused on a single issue or prepared to place the organization’s priorities above a personal interest? Through the conversation, someone’s past experience with nonprofit boards and communication style become evident. Often, red flags about a prospective board member’s behavior will arise during this interview. Good recruitment may not eliminate all the surprises later, but ensuring someone understands a board member’s role from the start certainly lessens the likelihood of bad behavior. That, in turn, creates a more positive experience for everyone in the organization. Dr. Gary Kelsey is a faculty member in the School of Public Policy and Administration at Walden University. As a consultant, he has also provided assistance and training to more than 350 nonprofit, philanthropic, education, and government organizations.